February 2006... Another year begins. I didn't get upto much with the car over winter. It was too wet and cold to be motivated enough to work on it and with the salty roads everywhere, even cleaning it seemed like a waste of time. But soon enough, winter had passed and spring was on the doorstep! The drivers side driveshaft had lasted me well... it had not been replaced since approx 2001 and had seen some serious track abuse! 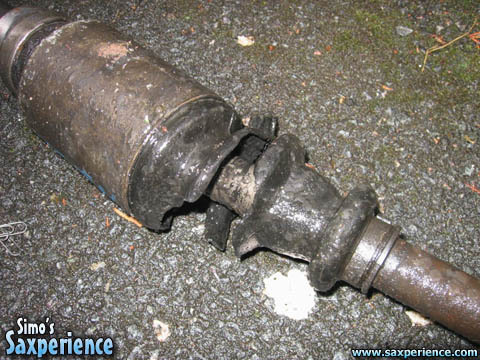 A replacement shaft was sourced from a local parts distributor and fitted fairly easily, allbeit in the pouring rain! 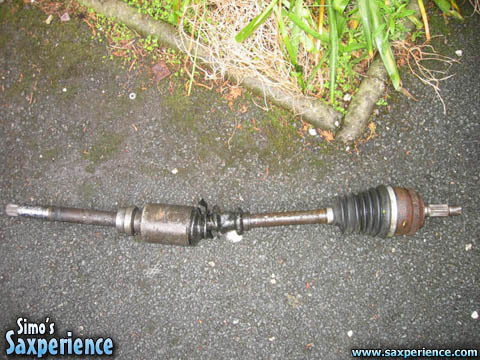 With the new driveshaft fitted the car was in perfect running condition once more. The AP race clutch was still very hard work in traffic, but it bites stronger than any other clutch I've had fitted. There's absolutely no chance of it slipping, which is probably why the transmission keeps getting a battering! With the car not being used everyday now, the ICE install seemed like a waste... it was very rarely listened to, as I prefer to listen to the neat sounds the engine makes whilst blatting around. The decision was made to rip out the ICE once and for all and take the car one step closer to being a track toy! I was driving on my way to Long Beach Resort when my cv joint boots failed. There was that popping and clicking noises. So I had my car reverse but the noise got louder so I have to go down and check. Good thing I got my tools with me and there was actually a nearby auto repair shop and we asked for some help. And gladly we had our vacation nice and smoothly.